"90 Days, Part III: Power Play"
Another day, another chapter of Emerald Dawn II. If you need to catch up, you can do so here and here! Picking up right where we left off, Hal is reentering his prison cell in direct view of his new cellmate Willie. The poor gent begins to panic, and Hal quiets him down with an emerald muzzle. When he finally settles down, Hal comes clean about his dual identity... I honestly wasn't expecting that to happen so soon. I really thought, from the final image in the previous chapter, that Willie had hurt his head in the fall, and Hal would be able to talk his way out of spilling the beans. We join our hoosegow pair getting their eats at the mess hall. It would appear that our Willie is something of a prison legend. A revolving door jailbird who is referred to as Gentleman Will. He may be a gentleman, but he's also something of a klutz... he accidentally spills the entire contents of his tray onto a rather unsavory (yet sorta-kinda familiar) convict. Our hero Hal intervenes. He tells the creep that he's made his point, and that he'd best sit down. Before their altercation devolves into a brawl, the prison guards (where have they been, anyway?) get involved and attempt to haul them both off for disciplinary action. Lucky for Hal that his plucky caseworker, Guy Gardner arrives on the scene just in time to save his bacon. As the guards drag the bully away, he notices Hal's ring... and makes the connection. As it turns out, this goon was one of the bank robbers Hal wrangled back in the first issue. Guy wants some one-on-one time with Hal so they can discuss his situation... however, Willie inserts himself by comically stealing (and returning) most of Guy's personal effects. That night, back in the cell Sinestro comes a'calling. He eyeballs Willie, and immediately attempts to give him the ol' mindwipe. Much to his (and I would assume several readers') annoyance, Hal stops him before he can. The next several pages is a montage of the coming weeks. Hal is, by all accounts working a double-shift, and burning the candle at both ends. He's awake all day as prisoner Hal Jordan, and training all night as Green Lantern... we see him taking part in chess matches and football games, while attempting to learn better control over his ring-wielding prowess. One day, while mopping up the floor, Gentleman Will is approached by the goon he spilled his food on those several weeks (and pages) earlier. They share some brief yet contentious repartee before the goon pulls a shiv. Next we are treated to some hot showerin' action with our pal Hal. A guard frantically enters the communal showers and informs him that his cellmate has just been shanked... still alive, but not in good shape. As Hal is heading out to see his fallen friend, Sinestro makes his nightly appearance. He informs his trainee that time is of the essence... there's no time to check on Willie. Hal begrudgingly suits up, and the two fly off... to Korugar. 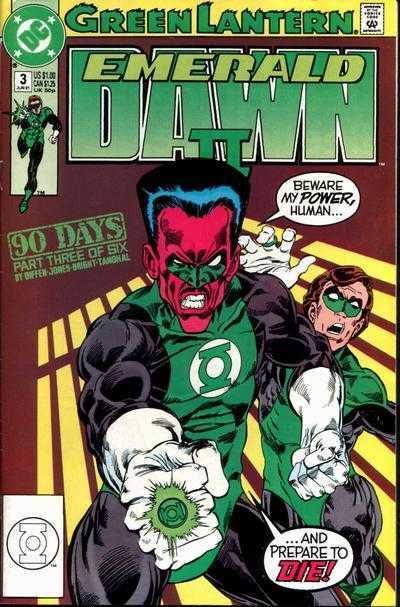 Hal is shocked to see the regard in which Sinestro is viewed on his home planet... less like a hero, more like a god. He is also rather confused that the planet appears to be completely empty... that is, of course, before the Lanterns are attacked by an armed uprising! Okay... another great issue! I must admit that I feared this would be like 95% space battles to 5% Hal in jail... which would have bored me, quite honestly. I, having started with Green Lantern during the 1990's became more accustomed to a more terrestrial/Earth-bound Green Lantern. Every time he went into space, I kinda glazed over. Even to this day... although I've softened somewhat to the space stories, I'd much prefer Hal (or whoever) be on Earth. This issue was mostly Hal as Hal... on Earth, and it was a great, fun read. Gentleman Will is an interesting addition to the cast, and, while I get the feeling he could (have) become rather annoying, managed to win me over. His appearances were well placed, and well spaced... that is to say, I don't feel as though he overstayed his welcome. Of course, if I find out in the next issue that he didn't survive the shank... I think I'll be a bit bummed. As for the creative side... I gushed during the first issue... and my gushes still stand. This is one helluva creative team, and definitely among my favorite Green Lantern architects (are we still calling comic creators that, or has Marvel found another way to avoid labeling them as "comic book creators"?). We're halfway through, and I'm still quite pleased. Definitely recommended. All delivered by window-less van!